With all the rain we have been having here lately, I have had the perfect reason to stay in more than normal, and have had time to write. I haven't told you (or many people at all) but after reading about NaNoWriMo at the blog of the lovely Krysten at Why Girls Are Weird I thought it could be fun. I had only heard about NaNoWriMo once before, a long time ago but not given it more thought and I wasn't aware we were about to enter that month. (Krysten wrote about it 5 days before it started) For those who doesn't know what it is I'll give a quick intro. 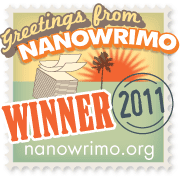 NaNoWriMo is short for National Novel Writing Month, and it's all about writing (a novel of ) 50 000 words in the month of November. Having been writing on a novel for quite some time, I thought it sounded impossible almost, to get that much done in such a short time. It actually equals to writing an average of 1667 words A DAY, every single day of November to reach the goal. After reading Krysten's post, I thought it was a shame I didn't know about it before, cause it seemed impossible to do this with no preparation and not even an idea, but the thought of it didn't leave my mind alone, and 3rd November I sat down and started brainstorming. After a little while the ideas of characters and the story sort of just came to me and I started writing. I still thought it sounded too stressful, also considering that I was 3 days "behind" schedule already before starting, but here I am on day 18 and right on schedule (actually a little ahead), and I am loving every minute I spend writing! I haven't taken the concept of NaNoWriMo too seriously, or... rather I don't know much about it. I just see it as a competition against myself to see if I am able to actually write all that, in a story that is hopefully good in one month time. So my goal is to reach 50000 by December 1, but not to finish the first draft of the novel by then. I want it to be longer, around 80000 words maybe (although that's impossible to decide until I finish). But for now, it's going great and I am having a blast with my characters and what they are getting up to! Megaspennende! Hadde lyst til å være med sjæl, men kjente meg selv godt nok til å vite at store deler av november går med til det halvårlige skippertaket før eksamen. Jeg får bruke desember eller januar som min PeNoWriMo - Personal Novel Writing Month. Håper forresten vi kan få en smakebit på det du skriver? En liten teaser, iallfall? Liker ideen om PeNoWriMo, Siri! Det handler jo egentlig bare om å bestemme seg for å gjøre det. Det er kjempegøy, men biiittelitt stress også, for jeg er kjempekonkurransemenneske i min egen lille mot-meg-selv-konkurranse :) Ikke søren om jeg skal gi meg! Yay, I'm so glad you're participating! It's definitely a fun time if you don't take it too seriously. Oi, wow, det var fint formulert. Alle sier jo at man skal ikke gi opp osv....haha. cool! Håper du får en fin og koselig lørdagskveld! Takk, Mette! Jeg får tenke på saken ;) Jeg storkoser meg! I think it's a great challenge! Will you be posting much of what you write? Regarding the nutella truffles recipes, there are lots on the internet, just google it and find one that suits you, quite a few variations out there!